This illustration outlines the key steps in identifying beneficial owners and demonstrates how technology can help to cut through the morass with speed, safety and a uniform approach. 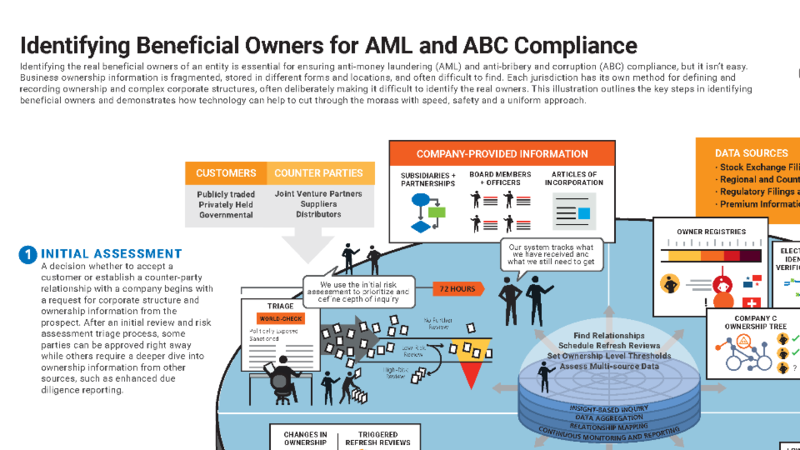 Identifying the real beneficial owners of an entity is essential for ensuring anti-money laundering (AML) and anti-bribery and corruption (ABC) compliance, but it isn’t easy. Business ownership information is fragmented, stored in different forms and locations, and often difficult to find. Each jurisdiction has its own method for defining and recording ownership and complex corporate structures, often deliberately making it difficult to identify the real owners. This illustration outlines the key steps in identifying beneficial owners and demonstrates how technology can help to cut through the morass with speed, safety and a uniform approach. We have emailed instructions to access Identifying Beneficial Owners for AML and ABC Compliance to . Make sure the email arrives in your inbox: either add "support@oceg.org" as a safe sender to your email platform, or if you use Gmail, drag our email into your Primary tab.